On New Years Eve, 2013, at 11:58 p.m., Yaleni Santos Tohalino gave birth to baby girl Lorraine Yaleni Begazo, who weighed 6 pounds, 4 ounces, at MedStar Washington Hospital Center, in Washington, D.C. Soon after, her twin brother Brandon Ferdinando Begazo was born on New Years Day, 2014, at 12:01 a.m., weighing at 5 pounds, 10 ounces. 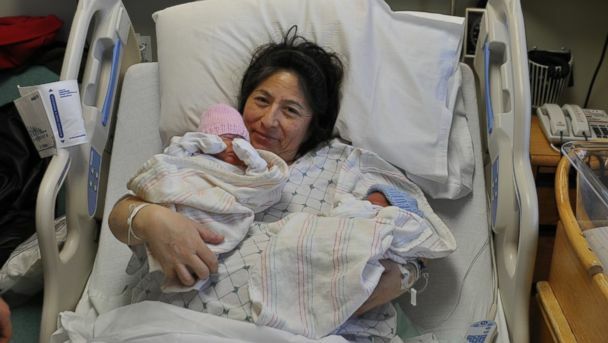 n Toronto, two fraternal twin sisters were also born in 2013 and in 2014, respectively. At Trillium Health Partners-Credit Valley Hospital, Gabriela Salgueiro was born on Dec. 31, 2013, at 11:52 p.m., weighing 6 pounds, 16 ounces, then younger twin Sophia Salgueiro entered the world on Jan. 1, 2014, at 12:00:38 a.m. weighing 5 pounds, 13 ounces. Both the mothers and babies are healthy and looking forward to going home.